On any item page just click the "Estimate Shipping" button near the bottom of the page and enter your location information to get an actual shipping quote. Various carrier and shipping method options will be offered. Feel free to email or call if you have any questions or need special arrangements. You will be given a number of different shipping options from which you may select during checkout. In the United States, we offer Priority mail and Express mail through the United States Postal Service, as well as UPS ground and air services. Internationally, we offer first class mail, Priority mail, and Express mail, as well as UPS. 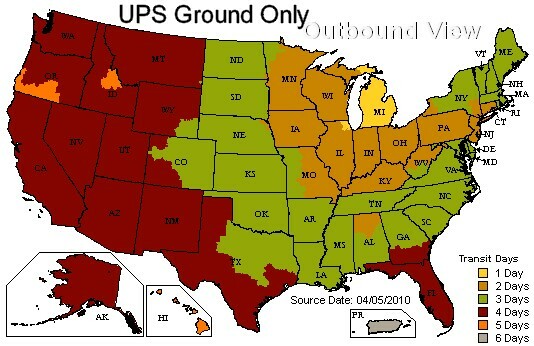 Please be aware that UPS charges very high brokerage fees for international shipments. If you need to use a different shipping option than what is offered online please contact us, or make a note in the order comments section at checkout. In addition to shipping to the 50 United States of America, we also ship to Canada on a daily basis. We also ship to most European / Asian countries on a regular basis. Most orders from other countries are also accepted, but will be evaluated on a case by case basis. If you have questions, please e-mail us. Priority Mail - Will almost always arrive in 2-3 days, with the great majority of parcels taking only two days in transit. However, Priority mail is not a guaranteed service, so there is no need for alarm if, in rare instances, a few extra days are required. Express Mail - Guaranteed in no more than 2 days. In about 75 percent of cases, the parcel will arrive with only one day in transit. First Class Mail - First class is an economy service and does not offer a guaranteed transit time. Average time based on our experiences is 10 days to 2 weeks.. Significantly longer and shorter delivery times can be expected. We have seen items take from a few days to over a month to arrive. First class is not a trackable service. Do not use for any item valued over $100. Priority mail - Average time in transit is 5 to 7 days. Please recognize that with ANY international service, customs clearance can delay the shipment. Priority mail International is not a trackable service. Express mail - Average time in transit is 3 - 5 business days. Tracking is included. We recommend that you choose Express mail when placing an international order on our website. UPS - Offers fast and reliable International delivery, but it is very expensive and VERY high customs and brokerage fees will likely be added which are the customer's responsibility. When we ship your item, you will be e-mailed a tracking number. Please wait at least 24 hours after receiving the number before attempting to track the item to allow time for the carrier's system to populate the data. If you placed an order online and did not receive a tracking number if is for one of two reasons - either the spam blocker on your e-mail is too aggressive (check your spam box), or (most commonly) you entered an incorrect e-mail address. Orders placed by phone generally do not receive tracking unless specially requested.Please ensure that a responsible individual will be available to sign for the package (if necessary) and ensure it's safety upon arrival.